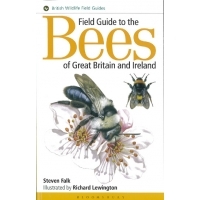 Field Guide to the Bees of Great Britain and Ireland by Steven Falk, illustrated by Richard Lewington. A new long-awaited field guide to the bees of Great Britain, Ireland and the Channel Islands. llustrated with over 1000 colour and black & white artworks plus over 700 colour photographs. There are 234 up-to-date distribution maps and a comprehensive introduction to bees including field techniques for identifying and recording. Also includes detailed texts for all 275 British and Irish species, covering field and microscopic characters, similar species, variation, flight season, habitat, flowers visited, nesting habits, status & distribution, and parasites & associates. Contains a series of innovative illustrated keys to genera and species.Softcover, 432 pages.